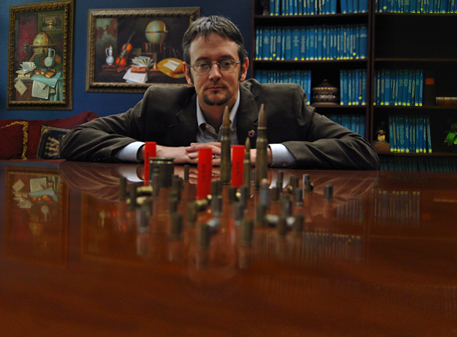 William King, associate professor of criminal justice, has received a $341,807 grant from the National Institute of Justice to study the use and effectiveness of a national database of forensic ballistics evidence. The National Integrated Ballistic Information Network, operated by the federal Bureau of Alcohol, Tobacco, Firearms and Explosives, is the only database that allows a nationwide comparison of ballistics evidence to determine if different crimes are connected to a single firearm. Oftentimes, when firearms are used in crime, spent cartridges are left at the crime scene. These cartridges possess unique tool marks that link it to the weapon, in a way, similar to a fingerprint identifying a suspect. The two most helpful tool marks are the firing pin and breech block impressions. The NIBIN system scans images of these tool marks, digitizes them and adds them to a national database of criminal evidence. These digitized images then can be searched by local law enforcement agencies. Local agencies can input digital images of their evidence at 190 NIBIN terminals located in state police agencies and major crimes labs across the country. The database provides the potential to speed up investigations and alleviate the tedious task of comparing numerous cartridges under a microscope. Since the bureau began using this technology in 2001, more than 7,653 local law enforcement agencies have participated in the program. More than 1.6 million pieces of evidence have been entered in the system and produced more than 34,000 hits that links at least two different crime scenes, according to NIBIN website. The research will study how the database is used across the system and how detectives specifically utilize ballistics information in their investigations, such as identifying suspects or leveraging information. King plans to interview investigators from 10 different agencies as well as survey NIBIN managers and users during the study. The study also will investigate why some law enforcement agencies do not use the system and identify the system’s successes and challenges. Finally, the study will identify best practices for improving the effectiveness of the database. The research team will include Vincent Webb, dean of the college; William Wells, associate professor of criminal justice; and Chi-Chung (Jorn) Yu, assistant professor of criminal justice. The study is funded through May 2012.